There are a variety of opinions on what makes acne scars vanish, and the only real consensus is that time plays an enormous part in the process. Acne scars are unfortunate and can be very discouraging, but you do have to be patient and let your skin do its job and heal itself. However, in some cases, you - or your dermatologist - may be able to help nature along in that quest. Before you can choose which treatment is right for you, use a mirror to examine your scars. Here is a list of some common scars from acne. Know the scar type so you may ask your dermatologist for the best acne treatment option available. Skin color changes: Technically, these are not considered scars; however, these do sometimes require treatment to even out the skin tone. Ice pick scarring: Ice pick acne scars look like deep pits on your skin. They resemble puncture marks. The edges of the scars will appear rough and steep. Atrophic scarring: Atrophic scars are also deep and pitted. However, the edges of the holes are smooth. Typically, atrophic scars are not as deep as ice pick scars. Hypertrophic scarring: Hypertrophic scars are lumpy-looking scars that may cause the skin to look thick and uneven. These scars are normally found on the body, but they do sometimes occur on the face. Look on your back and chest for hypertrophic scars. Some acne scar treatments are appropriate for home use and don't require prescription medications or a doctor's intervention. Most skin color changes will improve over time, but some over-the-counter therapies can help. Mild forms of acne may just leave spots on the skin, which fade away over time. If you want to hasten the process, use over-the-counter skin creams designed to lighten dark spots. Many of these contain hydroquinone, a bleaching ingredient. Use a sunscreen diligently to keep spots from re-darkening during treatment. Clinique Even Better Skin Tone Correcting Moisturizer. If there is one brand that knows about skin, it is Clinique. Not only do they have a wide range of products (so you can create your own targeted skin care routine), but they also offer a tone-correcting moisturizer. For about $50 (1.7 oz), skin will appear brighter and more even in four to six weeks. This cream has a built in SPF 20 to prevent further discoloration. Derma-E Very Clear Moisturizing Cream. Another great option comes from Derma-E. This product is vegan, cruelty-free, and does not contain sulfates, parabens, or gluten. At around $20 for a 2 oz container, it is an effective and affordable option. The cream is designed to clear existing breakouts, prevent future issues, and reduce redness. It contains natural ingredients like tea tree, rosewood, and lavender to help you achieve smooth and even skin. NeoStrata Pigment Controller. It is possible to achieve brightened skin and lighten dark spots caused by acne. This product from NeoStrata ($70 for 1 oz) is considered one of the best on the market. Not only has it been found to fight hyperpigmentation and scarring - but it made Allure's list of the top 9 Dermatologist-Approved Acne Scar Treatments. While skin renews itself on its own, you can help it along with gentle exfoliation. According to the University of Maryland Medical Center, this process can fade discoloration and blemishes. Simply exfoliate with a washcloth rubbed in circular motions (the free way to do it) or buy a product designed to slough off the upper layer of skin. Just be careful not to scrub your face too vigorously or disturb existing pimples. Neutrogena Deep Clean Gentle Scrub. To keep your skin both clear of blemishes as well as exfoliated, reach for this ultra-gentle product from Neutrogena. Unlike harsher scrubs, it can be used daily to unclog pores and remove dead skin cells. The best part? The cost is under $8 for a 4 oz tube. GlamGlow Youth Cleanse Daily Exfoliating Cleanser. One of the hottest names in skin care is GlamGlow. They are known for their high-end products and celebrity fans. This cleanser is about $25 for 5 oz of product - and promises to cleanse, smooth, and renew. St. Ives Apricot Fresh Skin Scrub. There are many exfoliating products out there today. One that works well (and smells great) comes from St. Ives. This costs less than $5 for a 6 oz tube and will instantly leave you with softer, smoother looking skin. If the scarring is more significant, over-the-counter therapies may not be effective. Your dermatologist has a range of treatments - prescription therapies or procedures - that may be able to improve the appearance of acne scars. A topical bleach like prescription-strength hydroquinone can be used to make acne scars vanish. This has been very effective for a number of users, but people also report burning and even deeper reddening of the scar. Furthermore, it may be associated with more serious medical problems, although this is still under debate and study. If a dermatologist suggests you try it, ask to use a sample first to determine your skin's response. Prescription-strength retinoic acid (like Retin-A or Accutane) has also been seen to make acne scars vanish, along with tackling the active acne itself. Be aware that when using one of these medications, you will look worse before you look better, because skin will initially be very red and dry. However, this should only last two weeks or so. You may also be more sensitive to sun exposure while using this medication. Your physician will want you to continue regular follow-up while using these medicines and it is important not to get pregnant while taking them. 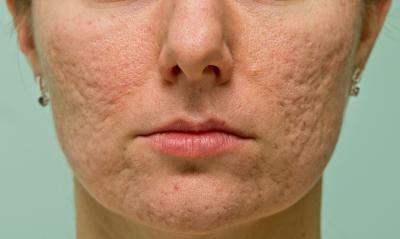 More serious acne scarring may require chemical peels for treatment. There are products containing alpha hydroxy acid that you can use at home, but the acid content will be low. A dermatologist uses chemical peel agents with much higher concentrations of acid. Unless you're really on a budget, it's probably a better option to visit a professional for the best results. Microdermabrasion is a gentler acne scar treatment and carries fewer risks of hyperpigmentation (skin darkening) than laser surgery or standard dermabrasion. It involves spraying the skin with a high-pressure stream of crystals made of aluminum oxide or salt. A vacuum then removes the crystals and exfoliated skin cells. The treatment causes some skin redness, which should go away within a few hours. Skin may continue to look a bit pink or tender for the next few days. Each treatment takes less than an hour, but it usually takes many treatments to achieve a good result. You may need to return once or twice a week for several weeks to several months. Microdermabrasion will not work for very deep acne scars. You have used isotretinoin (Accutane) within the past year. You have skin cancer or certain other types of skin tumors. Dermabrasion is essentially the sanding away of the top layer of skin. Dermabrasion machines use wire brushes, fast-spinning wheels covered in diamond dust, or similar devices. Either ice packs and a freezing spray, or an injectible anesthetic like lidocaine, is used to numb the skin. Afterward, an anesthetic-containing compress helps reduce stinging and pain. Dermabrasion leaves the skin red and raw-looking for several days, and then noticeably pink for two or three months. The pinkness will fade as the new skin develops. Scars should continue to improve even after the pinkness has gone away. It takes about six months to see the final result of dermabrasion. This procedure attempts to level the surface of the skin by separating the acne scar from deeper tissue. Once this happens, the blood that's released helps to form connective tissue beneath the scar, in essence raising the pitted area. Subcision is often performed in conjunction with some form of resurfacing. For severe acne, laser therapy will often be your best bet. The laser helps to remodel the scarred skin so that it appears smoother. Some types of laser also remove the top layer of skin to help even out the appearance of scars. Laser treatment usually leaves skin looking red and feeling raw. It will heal gradually over several days, and remain pinkish for up to several months as the new skin grows. This is one of the most expensive treatments and must be performed by a doctor. Be sure to research a doctor's credentials before going in for laser treatment; get recommendations if possible and ask plenty of questions. As with microdermabrasion and subcision, this treatment isn't without risks. Collagen or fat can be injected into pitted acne scars, to fill in the area below the skin and raise it up to the level of the surrounding tissue. Collagen is a molecule that is part of normal skin. The collagen for injections may be made from animal tissue, human tissue, or your own body. Fat tissue is usually taken from another site on your body. 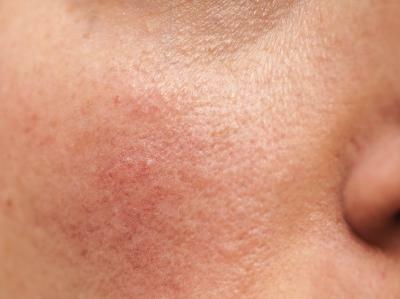 Very deep acne scars, sometimes called "ice pick" scars, will not improve with the above treatments. Your doctor may suggest minor surgery to remove the scar. This can be done in the dermatologist's office with local anesthesia in most cases. You may not see immediate improvement with this treatment as well but over time, the scars will be shallower and more likely to fade. There are some natural remedies that people may try to improve acne scars. Many people swear by vitamin E oil. Either they use the oil purchased from a health food store or break open a gel cap and apply the oil that way. A number of dermatologists warn, however, that topical vitamin E is unproved for this sort of treatment and has in fact been observed to worsen an acne scar. Other natural remedies that seem to be safer and more effective include camellia oil. This is a light cooking oil not commonly used in the States, pressed from the camellia seed. It is available either online (Amazon sells Japanese Organic Camellia Seed Oil for less than $10 a bottle) or in natural food markets. Many users attest that massaging it gently into the scars twice a day will make acne scars vanish, although the results will not be noticeable for many months. After a year of solid use, however, a number of scars - even older, deeper scars - may disappear. Emu oil, derived from the Australian flightless bird, has also been known to help lighten acne scars. It can be purchased online from pharmacies like Walgreens. (The Natural Treasures Emu Oil costs about $15 a bottle.) Anyone wanting to use these oils should be mindful, however, that they must go lightly and massage thoroughly, because oil can also promote acne. These oils are generally reported to be non-acne causing, but it's good to be aware. Whole milk plain yogurt can also help lighten acne scars. A yogurt mask contains AHAs, so it is healing and stimulating, as well as lightening. For further lightening and treatment, mix fresh lemon juice into the mask. This gives your skin a blast of pure vitamin C and lemon juice is a natural bleach. Lime or lemon juice can also be used alone to lighten acne scars. These juices act as bleaching agents. There are a variety of home remedies that have been used to help with acne scars. These include honey, tomatoes, aloe vera, olive oil, egg whites, and cucumbers. These can be helpful with mild scars; if you have more severe scars, these home remedies probably will not be very useful. Even if you try home remedies, letting your health care provider know about your plan may prevent some adverse effects. If you have a bad reaction to one of these remedies, you should also contact your physician for an evaluation. Invest in a primer. This step is important as the silicone base helps to fill in any pits or lines and even out scarred areas. That immediately leaves the skin with a smoother finish. Choose something like the NYX Color Correcting Liquid Primer (about $14) to combat redness and discoloration. Stick with a matte foundation. Though many products promise a dewy or shimmery look, these are not ideal and in most cases should be avoided if you are looking to hide acne scarring. It's important to choose a a matte finish. Otherwise, any unevenness you have will be more obvious. Use concealer thoughtfully. As tempting as it can be to layer on a ton of concealer, this can make the skin appear cakey and unnatural. Apply a thin layer and blend with clean fingertips or a damp beauty blender. Any concealer will do, but the Cover FX Blemish Treatment Concealer (around $25) both covers and heals breakouts. Set your makeup with a setting spray instead of powder. Adding on a loose powder is a great way to set your makeup and help it last longer, but it can actually look heavy and make acne scars more noticeable. Instead, use a product like the Urban Decay All Nighter (just over $30) to keep your skin looking naturally flawless. 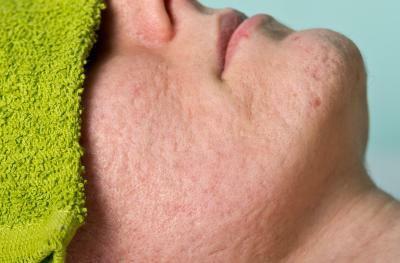 Unfortunately, what makes acne scars vanish best is to avoid them. Some acne will scar you no matter what, but you must try not to touch the spots. For bad cysts, apply ice. This will relieve discomfort and sooth the skin and perhaps help prevent scarring. Squeezing and picking can also worsen acne scars. Preventing acne scars is the best plan of action. If you are faced with scars, however, one of these treatment options may make the marks less noticeable.